Paper Folders increase your productivity saving you time and money. These paper folders are a great addition to any school, business, church or association who sends out statements, invoices, pamphlets, bulletins and newsletters. These folders can create a variety of different folds and some have the capability to create custom folds. Most are designed to handle many different paper sizes and thickness. FREE SHIPPING ON ALL PAPER FOLDERS. 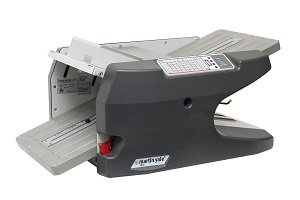 Desktop Folding Machine with Feed Tray and Paper Catch Basket perfect for Small Jobs requiring 4 Standard Fold Types and Automatic Shut Off. Ideal for Larger Offices requiring Manual Fold Table Setup for Paper up to 8 1/2' x 14' at Speeds up to 9,000 Sheets/hour. Produces 5 Standard Fold Types. Perfect for any Size Office, requiring Manual Fold Table set up for Paper up to 12' x 18' at Speeds up to 10,300 Sheets/Hour. Creates 5 Standard Fold Types. The PF-P280 Folder is an Exceptional Desktop Paper Folder, Capable of Folding Speeds up to 190 Sheets/Minute. Ideal for Producing Bulletins, Newsletters, and Mailers, the PF-P280 is the Perfect Timesaver for Churches, Associations, and Schools. Mid-sized Model with Manual Fold Table setup and Variable Speeds between 5,000 and 12,000 sheets/hour. Feed Capacity of 500 Sheets and Creates 7 Fold Types. Quick Set up and Easy Operation. Assisted Positioning Guide Quickly Dials in 6 Different Pre-set Folds and can easily set up a Custom Fold. Ideal for Small Print Shops, Schools and Offices with multiple users. Equipped with Fully Automatic Fold Table Setup for Paper Sizes up to 11' x 17' and Variable Speeds from 3,000 to 15,000 Sheets/Hour. Produces 10 Custom and 7 Preset Fold Types.